Graduation Range Dial Reading Length In. (mm) Ball Dia. In. (mm) Description Dial Color Order No. *Attachments include dovetail body clamp (PT22429), tool post holder (PT11770A), swivel post snug with dovetail indicator clamp (PT22428), snug and rod unit (inch: PT22430 or millimeter PT27171). These are some of the most versatile and unique indicators available because the handy swivel head feature allows positioning to suit your line of sight from horizontal to vertical and at any angle in between 90°. 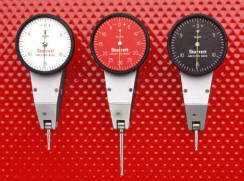 Why buy two or three gages to do what one will do - simplify your gage inventory.